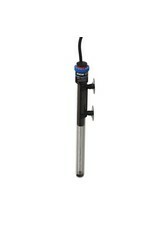 Aquaria EH JAGER HEATER 13" 150WATT - Rick's Pet Stores Inc. Precisely regulated, constant water temperature is very important for the comfort and success of your aquarium inhabitants. The Jäger TruTemp adjustable heater is an ultra-modern electronic thermal device offering today's best technology. 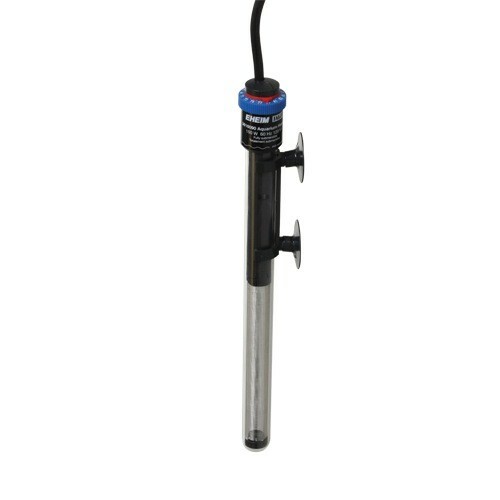 Designed for use in both freshwater and saltwater aquarium, Jäger TruTemp fully-submersible heaters include these great features: Shatterproof glass construction - Made with laboratory-grade glass, TruTemp heaters are free of pollutants, resistant to chemical and biological substances, and able to withstand extreme temperature fluctuations. Their glass jackets also enlarge the heating surface and ensure even heat distribution. TruTemp Dial - Temperature can be precisely adjusted from 18° to 34° C (65° to 93° F). Using the TruTemp dial with readjustment ring, the user can recalibrate the heater for a precise temperature reading. Control accuracy is +/- 0.5° C. Thermo Safety Control - This safety mechanism enables "running-dry" protection. The heater will shut off when removed from the water, and resume functioning upon return. On/Off Indicator Light - This convenient feature eliminates guessing and enables the user to verify heater function without getting their hands wet! Each Jäger TruTemp Heater also includes a mounting bracket and suction cups for secure and flexible placement within your aquarium system. Lastly, an extra long power cord accomodates most applications. Jäger TruTemp 150 Watt Heater Temperature Range: 18° to 34° C (65° to 93° F) Tank Rating: 53-79 gallons Dimensions: 13.63" Length / 1.4" Diameter Wattage: 150W Hertz: 60Hz Voltage: 120V13.63" x 1.4" dia.